Adrian has spent the majority of his working life in the financial services industries in middle-management roles and became a Member of the Institute of Administrative Management by examination and has since been made a Fellow. Following one particular restructure in Nationwide Building Society, his head office role as senior business analyst became redundant. Adrian then chose to become self-employed as a management consultant where his work became closely entwined with a need for graphic design capabilities. He undertook both aspects until his retirement 15 years later. As a graphic designer he worked for many small businesses as well as local musical societies where some of his posters won national awards. In recent years, Adrian has experienced TN on a small number of occasions. Hobbies include a lifetime of musical performances as a chorus member and as a soloist – both secular and religious as well as light opera – golf, writing and classical music composition. Jeannette became Treasurer at the AGM in July 2014. Before retiring in 2006 she and her husband, Doug, ran a retail business for 20 years. During this time she dealt with all the financial and administrative matters as well as dealing with customers. She was diagnosed with TN in 1999 and eventually had a successful MVD in 2008. While already a member of the West London Local Support group she became, and still is LSG Leader. More recently she has also become a member of the Telephone Helpline Team. After obtaining dental (Kings College London), medical (University of Cambridge) degrees and specialist training in oral medicine Joanna Zakrzewska went on to specialise in orofacial pain. Her MD on trigeminal neuralgia led to further clinical research in this field. She spent ten years as an academic at Queen Mary’s School of Medicine and Dentistry where she was awarded a personal chair in facial pain. 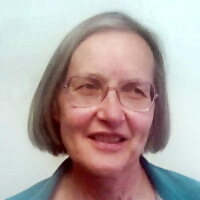 In April 2007 Joanna Zakrzewska moved to a NHS post at Eastman Dental Hospital, University College London Hospitals in order to set up a national centre of excellence in facial pain. She has written four books on orofacial pain, contributed to over 10 chapters and written over 80 peer reviewed papers on the theme of orofacial pain. She lectures extensively both nationally and internationally. She is a member of the TNA US Medical Advisory Board. After four successful and eventful years as Chairman, Jillie stood down at the AGM in 2013 remaining on the Executive Committee as a Trustee. 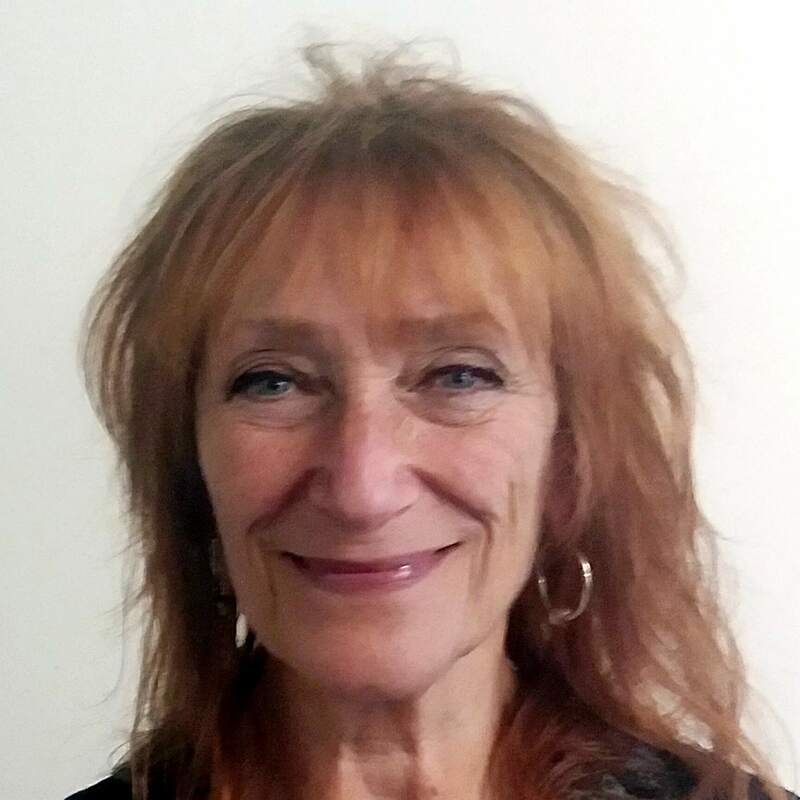 Jillie has worked tirelessly for the Association since joining the EC in 2003, firstly as Regional Support Group Co-ordinator and then as Deputy Chairman, having come from a background in the airline and motor industries. For 17 years she and her husband ran their own motor trade business but the onset of her TN in 1998 forced the early sale of the company and she wants non-sufferers to understand the destructive consequences of the condition on career prospects, relationships and family life. Jon has been a volunteer on the Helpline for several years. He is now the Helplines Co-ordinator, taking over from Jan. He finds the direct contact with TN sufferers and their carers stimulating, enjoyable and interesting; so many callers are desperate for information on TN and are also feeling very isolated. He suffered with TN for about eight years prior to having the MVD operation seven years ago. So far the operation has been successful with only minor side effects. Jon’s first career was in the retail motor trade, which was followed by 30 years as a police officer with Devon and Cornwall Constabulary. He retired in 2011. Jon now works part-time with Victim Support at the call centre for Sussex, Surrey and Thames Valley Police in Shoreham-by-Sea. Jon is enjoying retirement with his wife Jacqui and enjoys spending time with grand-children. Doug was confirmed as LSG Coordinator at the AGM in 2014. Although not a sufferer himself he has attended many meetings of the West London Support Group with his wife Jeannette who is now the current LSG Leader of this group. Prior to his wife’s diagnosis of TN and the subsequent involvement with TNA UK, he had worked for many years in the field of hospital design, construction, equipment and project management. 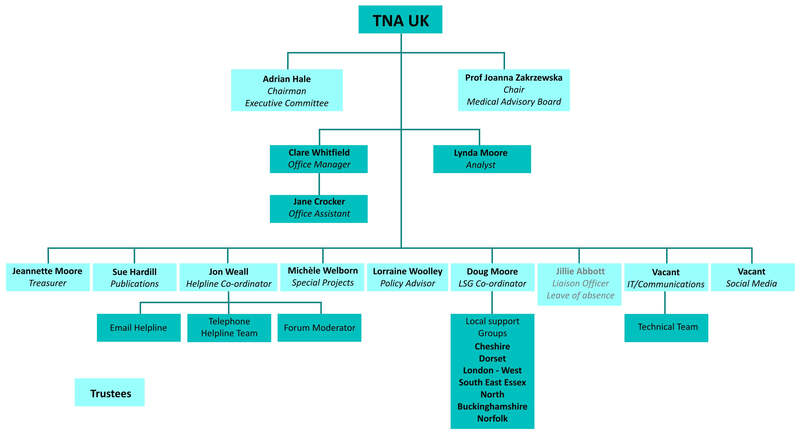 TN came knocking on the door a few short years ago, and Michèle found TNA UK and the Helpline. She attended the very informative Learning Day in Liverpool, gained greater insight into the charity and its aims, and then volunteered to become a Telephone Helpline supporter. The Leeds Learning Day offered yet more opportunity to discover how TNA UK helps its members and others, and was later delighted when asked to join the Committee. As there is no Local Support Group in her area, she is also hoping with Doug Moore’s help to start a group in the near future. Michèle began her teaching career in mainstream education, and then moved to special schools where she worked with children with Severe Learning Difficulties and their families. She was also for many years an antenatal teacher for the National Childbirth Trust. Lorraine worked for many years in the Entertainments Industry in Sales & Marketing working for various companies including the BBC. She also volunteered as a Special Constable in the Metropolitan Police for 42 years after retiring as Chief Officer and being awarded the MBE by the Queen. Lorraine continues to Volunteer in the Metropolitan Police helping the Special Constabulary. 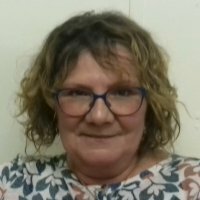 She has suffered with TN for over 35 years and her knowledge and experience has helped her run the South East Essex Support Group. Her hobbies are travelling, collecting Postcards and her dog. Before taking early retirement Sue was an English Teacher in secondary education. She is grateful that TN didn’t strike whilst she was still working! 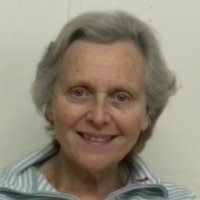 Originally from the north east, Sue has gradually moved south to the Bristol area via Yorkshire and Warwickshire, teaching in local schools with each move. She has also worked voluntarily as a counsellor, home tutor and as a representative for the Marie Curie charity. TN crept up on Sue with prodomal pain beginning in 2013. After three years of increasingly severe symptoms, unnecessary dental work and repeated misdiagnoses, she had a successful MVD in 2016. Part of making sense of it all came from joining TNA UK and after attending the annual conference volunteered to join the telephone helpline. Recently Sue was delighted to be asked to join the Executive Committee. Sue still regards herself as a TN sufferer such was the the profound effect the condition had upon her and remains committed to supporting the association in an effort to raise awareness about TN. Remaining pain free, Sue has resumed her interests enjoying yoga, singing in a choir, embroidery, cake making and cooking. She walks regularly (no longer worrying too much about the weather) with her husband and Golden Retriever, George, in between helping out with her first grandchild.